It turned out to be that kind of wonderful weekend you hope for on any vacation: sunny, fun, great outdoor family activities. And we didn’t even have to leave home for this weekend at Royal Gorge Cross Country Ski resort, home to the California Gold Rush Ski Race. By Friday night I was loading four pairs of skis into the car for the free kids’ fun race and obstacle course. I would be doing it all over again the next night for my own race of about 36 km. Our 7-year-old son (Alex) is always game for some outdoor competitive fun, but our 9-year-old daughter (Clara) was decidedly uninterested. I told her she didn’t have to race, but that the family was spending the morning on the snow at Royal Gorge, so she would be there regardless. When we arrived at the ski center, a girl Clara’s size was registering for the race. This was just the social motivation she needed and I easily registered both kids for the race. The kids skated a 3 km lap, then each racer received candy necklaces, Royal Gorge lapel pins, and unlimited cookies at the finish. 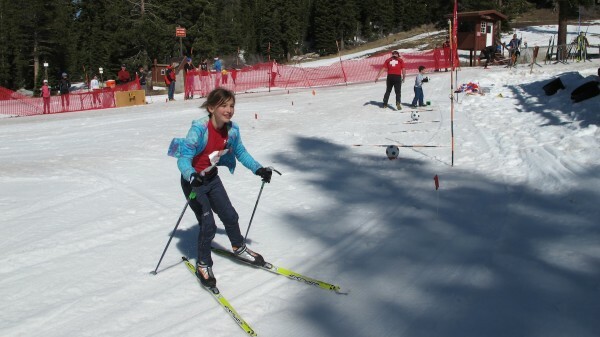 I hadn’t skied with the kids all season and I was so impressed with how much they have improved since skiing with the Tahoe Donner XC programs all winter. Clara skiing the obstacle course and Alex making shots in the background. We met other friends and skied for about an hour until the fun obstacle course was ready. The course included basketball biathlon, roller jumps and a slalom downhill. Our kids loved it and I was glad to see some of the older kids play around and enjoy the course, too. Huge props to Royal Gorge for hosting this event and to Franz & Johannes for setting it up and making it fun for the kids. At last, I was anxious to get off my feet and out of ski boots. I tried to relax for the rest of the day and make sure that everyone’s gear was dry and ready to go for the next morning. My race would be 6 laps of a 6 km course, and I really wanted the family there to support me at this one. They happily attended my first ski race, my first road marathon, my first ultra… but regular race support is not something they particularly enjoy. That being said, I hoped that a lapping course would be more interesting for them, and I really felt their cheering would help get me through so many iterations. It sounds like the start was rocky for my husband with the kids… things were hectic and didn’t settle down until the kids got engaged with helping at the lap aid station. I guess they missed me at the first lap, but I didn’t really notice because I was busy dropping my windbreaker and trying to hang on to two other skiers nearby. 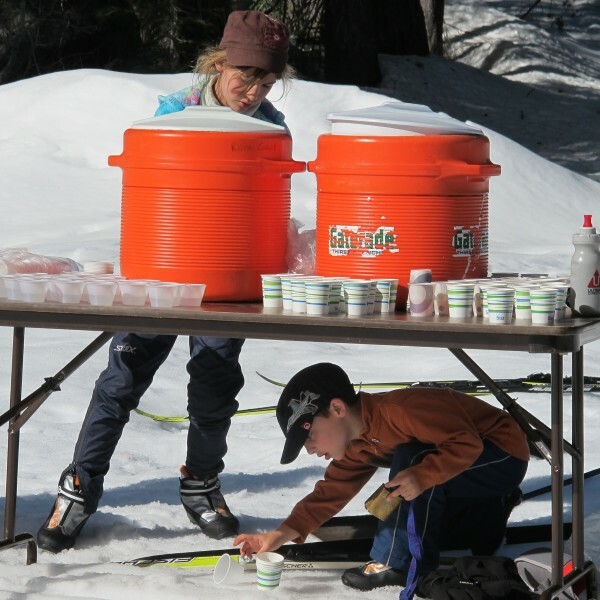 By the time I reached the second lap, Clara was serving water at the aid station and Alex was very active picking up empty water cups. Our awesome aid station volunteers at work. Photo by Daddy. At the finish, Clara, who didn’t want to race Saturday and didn’t even want to be on snow Sunday, informed me that some younger girls (“10- or 12-year-olds”) raced the Bronze distance and that she is really interested in doing that in the future! This is the end of the family fun race report. The rest is more just journaling that I’m writing for myself. Feel free to read on or not. 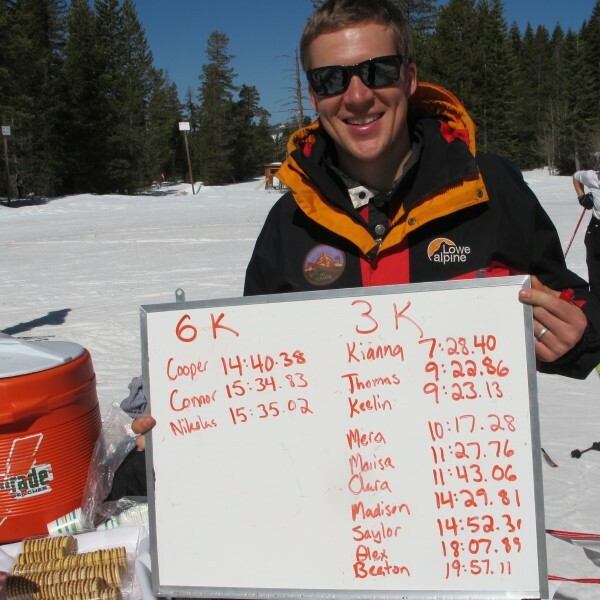 The Gold Rush ski race has been around in various forms since 1980. More recently it has been setup as a 15 km loop, with a choice of 3 distances: Gold (45 km), Silver (30 km) & Bronze (15 km or shorter). It’s common with ski races for the distance and course to vary according to snow conditions. This year, the low snow conditions mandated a much shorter loop – just 6 km – and therefore more laps. This year Gold would be 6 laps, Silver 4 laps and Bronze 2 laps. A dramatically dry and warm winter resulted in a downright pathetic nordic ski season in the Tahoe region. I managed to hit the ski trails fewer than 30 times; there have been winters when I’ve skied literally twice that often. All of the other long ski races in the area have been cancelled due to lack of snow. I was skeptical that the Gold Rush would happen. By Wednesday of last week, the modified course had come together and everyone at Royal Gorge assured me that the race was on. It happened to also be really fast snow that day. I felt like Bambi on skis… it was the only fast snow I had been on all year and it felt like the first day of the season. Not encouraging. I signed up anyway! I went back to ski a lap of the course on Friday. The conditions were excellent – by far the best I’ve skied this year. I started to feel a little better about my ability to complete 6 laps of 6 km. It initially seemed like the 6 km course would be more difficult because it removed one of the long flat sections from the old course that I’ve skied a few times. It turns out the the course actually worked better for me for a couple of reasons: 1.) the descent at the beginning was less steep; 2.) the climb back up to the start/finish/lap was shorter – maybe 2 km instead of 4 km; and 3.) the course was much shadier, almost completely eliminating the deep slush skiing on the primary climb. I prepped my skis with pretty deluxe race wax on Friday afternoon. Knowing that I would be out on the snow later than most the others, I waxed for the warmest conditions expected. I really wanted that wax to perform when I’m exhausted and the snow is mushy at 10:30 am. I warmed up for about 10 minutes and was a little bummed that my wax was felt slow. Did I really screw something up? I’d find out later in the morning. At the start – I am still wearing my signature yellow windbreaker. Photo by Hubby. The first two laps went pretty fast and the climbing pace was difficult to maintain. I had a mantra in my head, “This is not harder than chemo,” in memory of a friend who passed away last Spring. We used to do this race together, and for him, chemo treatment was more difficult than any of his impressive athletic endeavors. This mantra also helped me feel gratitude for the opportunity to ski, race, and share the weekend with my family. By the third lap I noticed that my wax was working really well with the snow conditions. My skis slid across the old, course snow like a butter-laden knife atop hot corn-on-the-cob. This made me happy and I felt pretty good during laps 3 and 4. At the start of lap 5 I hit a real low and felt myself giving up the desire to ski hard. This usually happens to me a lot earlier in a ski race, so that was actually an improvement. I was still skiing near the same two skiers (one guy and one gal) that I had started the race with, but I wasn’t exactly sure where they were. Somehow I made it through lap 5 and felt a competitive surge return. At the bottom of the last lap, I told myself that it was a new race – just 3 km. I knew this is where the guy skier could catch me because he was a light and strong dude. I crossed the finish line after 2 hours 30 minutes and ahead of both skiers that I had spent the morning with. I made an exaggerated “collapse” on the snow to mimic the elite woman skiers who I saw at the very same finish line during the women’s distance championship last year. My little Alex came with a cup of water and carried my skis for me. I hung out to cheer the few skiers who came in after me. Alex happily pointed out that I was not the dead last finisher, as I expected, but that I was probably “sixth or seventh from the last.” He thought this was pretty good, because he was second from the last at his race the day before. Such a cool and innocent way to look at your race placement… not how close you are to the front, but how far you are from the back. Meticulous timing by Franz for the kids’ races. Alex was proud of his second-from-last finish.